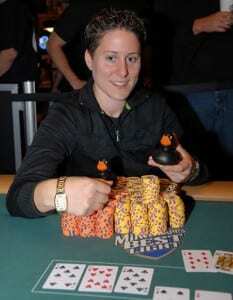 Straight on of Brooklyn New York Comes Vanessa Selbst. Mrs. Selbst is a professional poker player who currently is a member of Team PokerStars Pro. She was born in 1984 and is best known for the biggest earner in the female poker professional tournaments with a victory of over seven million dollars. Mrs. Selbst has been playing poker for over a decade; she started out playing poker online and live No Limit Texas Holdem and PLO Cash Games. After she had a good understanding of how to play poker like a pro, she moved on to professional tournaments in 2007. The best online poker sites state that Mrs. Selbst is currently a student of the prestigious Yale University. She started her education by attending the Massachusetts Institute of Technology her first her of university. Besides being an excellent online poker player as well as professional tournament players, Mrs. Selbst has taking part in coaching people on how to play poker well. The online poker review sites say that Mrs. Selbst is the executive producer of an online poker-training site called Deuces Cracked.